We have been using FlipBoard on our iPads since it first came out (Flipping through the news on the iPad just got better). 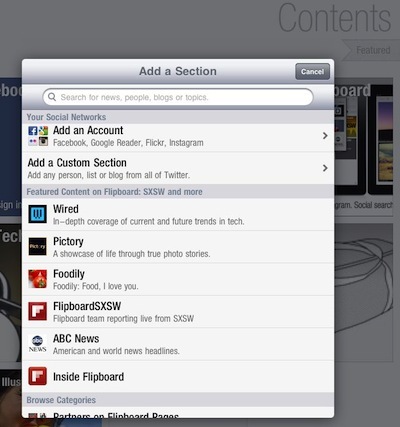 As a reminder, it’s a rethink of the way News Readers for the iPad works. You can set up a variety of social services and RSS feeds to sweep through like you would turning pages of a book. Using it the first time, you will be asking why others are doing it that way. 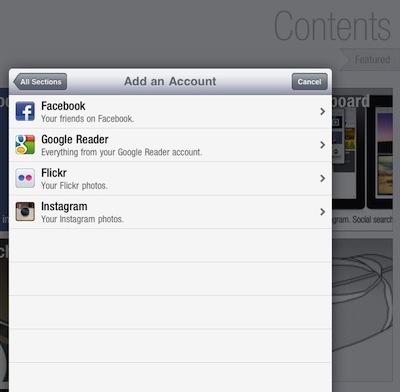 The day the iPad 2 was released, FlipBoard added a nice bunch of features… still free though. It continues to be easy to set up with your favorite news feed accounts, social services and Google Reader. 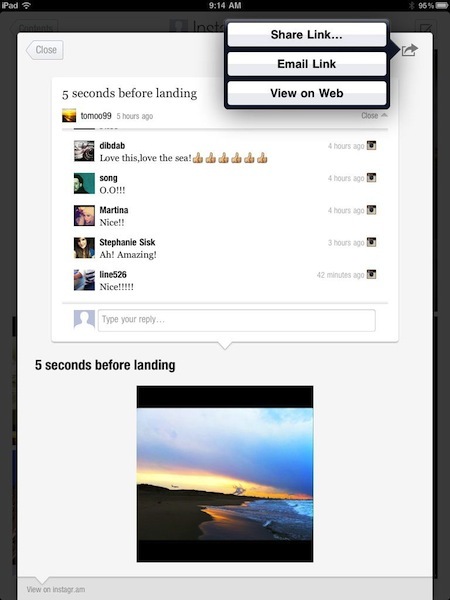 Each appears as a separate box that refreshes each time you launch FlipBoard or choose to update. Since each account is in a separate box, FlipBoard allows you to have multiple accounts for your favorite social media service. 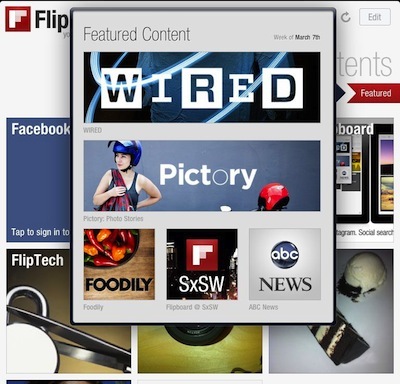 FlipBoard has added a group of ‘Featured’ feeds. Tapping the ‘Featured’ button on the FlipBoard opening screen brings up a list of feeds that you can access without setting up an account. New to the list of social services and RSS options is Instagram. Clicking on the box to bring up your Instagram account to view the images of those your following. You can have a separate section for each of your accounts if you have more than one. This is the same feature the app has had for Twitter and Facebook multi accounts. You will get a screen like this from time to time due to load time from Instagram, no reflection on FlipBoard… they have really improved their load times on services that can provide data quickly. 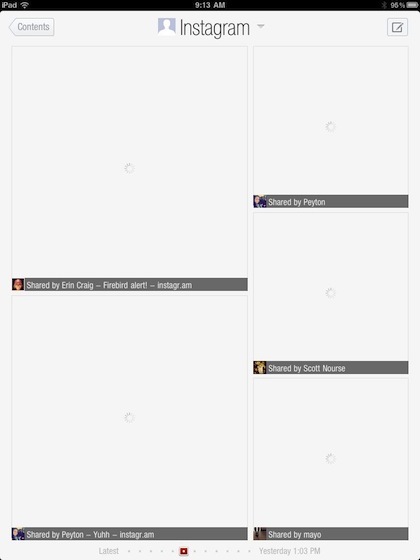 When images load, you get a variety of sizes auto adjusted by FlipBoard. 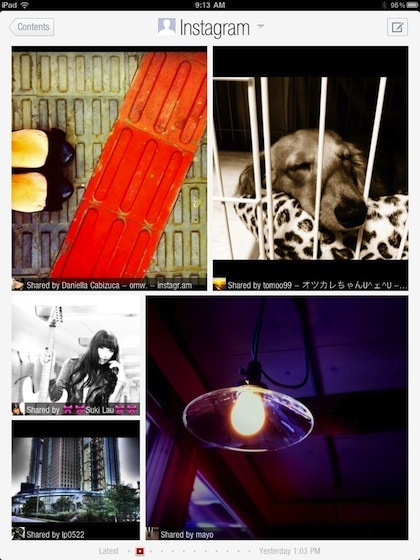 Flip through the pages of images of people’s images your following on Instagram. Much nicer way to view than even the Instagram app. When looking at one of your feeds like the Facebook or Twitter options, selecting a article will show if other people are re-twitting it. In the case of Instagram, you get a view of the comments people have made on that image. The FlipBoard share feature is very handy, allowing you to share or email the link to the image.